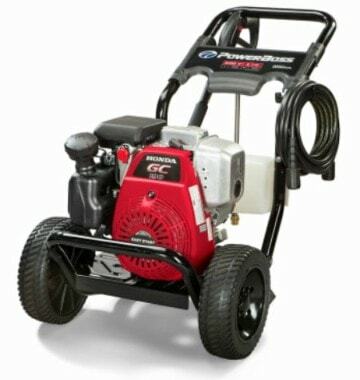 A gas powered pressure washing machine is specifically designed for various purposes. It is widely used in washing the cars, grills, small decks, patios, malls, parking garages, and outdoor furniture. Others use it for graffiti removal, fleet maintenance, construction-site cleaning jobs, surface preparation, paint stripping and more. 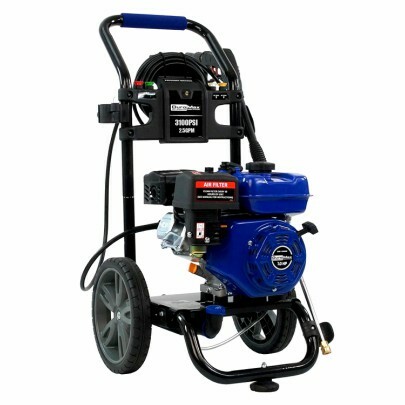 Whether it is for industrial or commercial use, gas pressure washers are equipped with features, parts and accessories to make them durable and dependable. Pressure washer manufacturers want to keep up with the competition that is why their products are added with extra features and free accessories. If you are planning to purchase a diesel power washer, you are probably wondering which brand or model suits your needs the most. To give you ease in shopping for diesel and gas pressure washers, we have compiled reviews of some of the top rated pressure washers on the market. This buying guide offers you information on the different factors to consider when buying a commercial gas pressure washer. How to Choose the Best Commercial Diesel & Gas Pressure Washers on the Market? One of the most essential factors to consider whenever you purchase a commercial diesel and gas pressure washer is its design. The machine should be specifically designed for comfort and functionality. Make sure the brand or model you purchase is made to maximize productivity and reduce discomfort and fatigue. Most pressure washers available today are equipped with ergonomic design to make them highly functional, durable, and dependable. Whenever you shop for a pressure washer, it is best to check whether the machine is portable or not. The product’s portability is an important factor to take into consideration especially if you need a machine you can easily transport from one place to another. Fortunately, gas pressure washers are made with high performance tires that is why they can be transported or moved around. Still, they come in different weights. If you want a highly portable pressure washer, opt for a lightweight machine. In order to make sure that your gas pressure washer is reliable and durable enough, it is wise to pick a reputable brand or manufacturer. You have to opt for a trusted brand so that you have peace of mind in terms of the product’s durability and performance. Manufacturers design their products with industrial-strength features and accessories so that they attract more customers and retain their loyalty. Before you make a purchase, make sure the machine includes all the necessary parts and accessories you need. Modern gas pressure washers are normally equipped with heavy-duty steel frames, mess-free detergent buckets, ergonomically-designed spray guns, interchangeable nozzle tips, adjustable wands, and never-flat tires. Ask the manufacturer if these parts and accessories are included in the package. On the other hand, you need to check if there are extra features included in the product. Pressure washers have different hose lengths. Consider the length of the hose before choosing a specific brand or model. In case you need to work on high or hard-to-reach places, it is best to opt for a diesel pressure washer with a longer hose length. In most cases, the length of a hose is 25 feet. On the other hand, a hose is usually made of three types of materials – Polyurethane, Rubber and PVC Plastic. A PVC plastic hose is the most common, while a rubber hose is heavier yet flexible. On the other hand, a Polyurethane hose is highly flexible among the three. Do not forget to be informed of the machine’s warranty information before purchasing it. This saves you from future troubles. For instance, if one of the significant parts of the machine gets broken, you can contact the manufacturer for replacement or repair without spending anything. Generally, a warranty period ranges from 1 to 2 years. Most of the time, manufacturers offer a 2-year warranty for both pump and engine. Commercial diesel and gas pressure washers for sale can be purchased at different prices. Depending on the brand, model and other factors, there are pressure washers that are costly while others are affordably priced. You are probably wondering what brand or model you should choose specifically if you are on a tight budget. Make a thorough research first before you buy the machine. The good news is, there are high performance gas pressure washers that are easy on the budget. The bottom line is, do no spend a great amount of money just to have a high performance pressure washer. A higher price is not always a guarantee of high quality and durability. 3. What is the machine’s power rating? Yes, it is. It comes with highly durable tires. Yes, it is. The machine includes a printed user’s manual with illustrations for easy operation. If you are searching for an easy to use and a highly durable pressure washer, the Duromax XP3100PWT can be the perfect choice for you. The machine is equipped with a built-in detergent reservoir in order to deliver consistent flow of cleaning agents. With the high performance features and accessories of this pressure washer, it is an excellent equipment in cleaning sidewalks, roofings, gutters, driveways and more. It comes with a 25-Ft non-marking hose and a comfort grip handle. 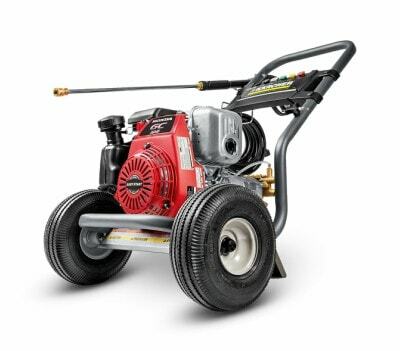 Moreover, it is designed with a dependable welded frame in order to protect both the pump and engine. Check out what other people who purchased this product think about it. Read Duromax XP3100PWT Gas Pressure Washer reviews. Yes, it is. The product includes a printed user’s manual with illustrations for easy operation. Powered by HONDA, the SIMPSON MSH3125-S 3100 is a powerful pressure washer you can rely on when it comes to cleaning the toughest, dirtiest places. If you are searching for the best gas pressure washer without hurting your pocket, the machine won’t let you down. It is designed with special features and accessories to make it an easy-to-use machine. It comes with a highly reliable engine, making it a dependable pressure washer for cleaning various things and places. Some of the great features of the product are its heavy duty spray gun, nozzles, and axial cam pump. Check out what other people who purchased this product think about it. 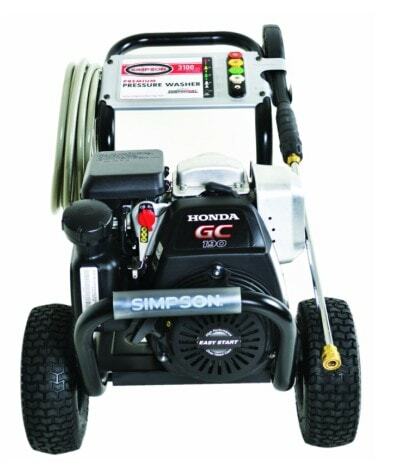 Read SIMPSON MSH3125-S 3100 Gas Pressure Washer reviews. Yes, it is. The machine is lightweight. Plus, it is equipped with oversized 10″ never-flat wheels. Yes, it is. It comes with a printed user’s manual with illustrations for easy operation. Reliable, durable, easy to use, and affordable – these are some of the good things users say about the Generac 7019 OneWash. This compact machine is able to clean everything with superb performance. It is equipped with a user-friendly design. The unit is easy to assemble, along with its connect hoses. Regardless of terrain, you can effortlessly move the machine from one place to another. It is equipped with PowerDial technology so that you can easily adjust the pressure required among four various tasks -soap, concrete, wood and car. On the other hand, it comes with a high performance horizontal axial cam pump that has the ability to deliver 3100 PSI for challenging cleaning jobs. Some of the fantastic features of the unit are its 196cc OHV engine and 25 foot high pressure hose. Check out what other people who purchased this product think about it. 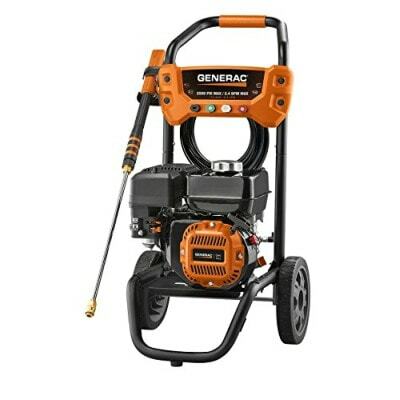 Read Generac 7019 OneWash Gas Pressure Washer reviews. Yes, it is. The machine has highly durable tires. 5. What is the fuel tank capacity? If you are in need of professional level cleaning results, the Karcher G 3000 OH is the one thing you’ve been looking for. It is designed with specific features and accessories in order to offer maximum durability and ease of use. This user-friendly machine is known for its unmatched design and quality. With its industry-leading features, it is considered one of the top rated cleaning machines on the market. The brand takes pride of its ergonomic design and high performance features. The machine is able to generate 3000 PSI at 2.5 GPM. Its industrial-strength pump is made with a brass head, which makes it highly durable. Check out what other people who purchased this product think about it. Read Karcher G 3000 OH Gas Pressure Washer Reviews. Yes, it is. It is designed with 10″ non-flat semi pneumatic tires. Yes, it is. The product is easy to use. Aside from this, it has a printed user’s manual with illustrations for easy operation. If you are looking for an efficient, hard working diesel pressure washer, the PowerBoss 20649 is a great choice for you. The unit boasts an Easy Start technology with higher PSI. It is designed with an industrial-strength engine in order to provide you ultimate power output. Since it has an outstanding axial cam pump, it offers low-effort starting. Aside from this, it is able to deliver satisfying performance at all times. On the other hand, the machine has 4 Pro-style spray tips to give you accurate control. Moreover, its soap spray tip is useful for a hassle-free cleaning detergent application. You can transport the unit from one place to another with its never-go-flat tires. Check out what other people who purchased this product think about it. Read PowerBoss 20649 Gas Pressure Washer Reviews. Needless to say, there are certain factors to consider when buying commercial diesel and gas pressure washers. The information you have read on this buying guide can help you choose the best machine for you. Keep in mind that a gas pressure washer should be equipped with the necessary parts and accessories for it to be durable, dependable, and worth the price. Look for a pressure washer with a commercial-series engine, steel-braided high pressure hose, a heavy duty welded steel frame, and quality pneumatic tires on steel hubs.